Economists have long argued that dynamic effects of policy changes are much more important in the real world than static effects, but this is not reflected in the majority of applied trade studies. This book departs from mainstream trade modeling and examines the dynamic aspects of international trade and investment policy by explicitly specifying dynamic mechanisms in a wide range of modeling approaches. 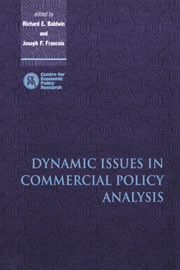 With contributions from leading economists Dynamic Issues In Commercial Policy Analysis will become a standard reference in international trade and policy research. 11. Labour markets and dynamic comparative advantage D. Roland-Holst.